Winter's not over, but here comes Easter and Passover. The weather is saying otherwise, but theoretically, spring is coming. That means Easter and Passover are on the way too. Although these events are celebrated by two different religious groups, they are celebrating similar concepts. Easter, Pasch, or Pascha commemorates Jesus Christ's resurrection from the tomb after being crucified and buried for three days. Passover, or Pesach commemorates God freeing Jewish slaves from Egyptian rule through Moses, and the creation of a new Jewish nation. What these two religious events have in common is new beginnings. Is it any surprise that they both happen at the beginning of spring, when new life appears after months of winter? To celebrate new beginnings this year, try something new: this centerpiece is gorgeous, but unique. 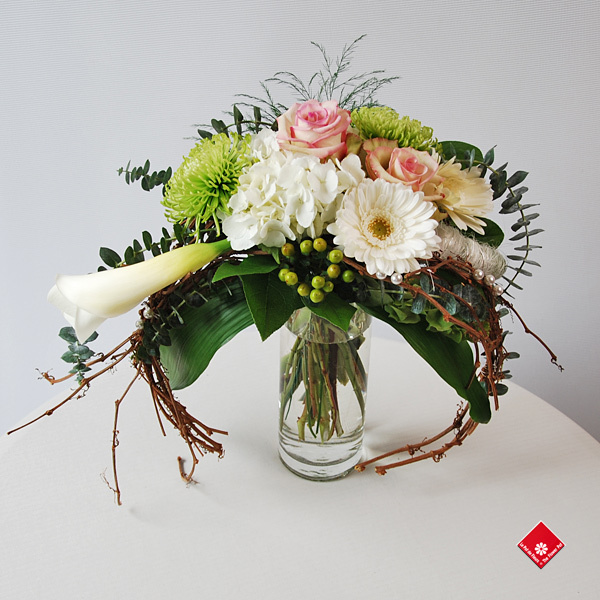 The flowers are organized around bent branches to create a crescent shaped arrangement. It can be used as a centerpiece for your Easter or Passover feast table, or as a decorative piece for a living room. We have plenty of other arrangements to choose from if this isn't your cup of tea. Check out our Easter and Passover sections and take your pick. Questions? Concerns? Call us at 514-938-1234 or drop by! Everyone at The Flower Pot is happy to help.